I started with photos I shot directly off the TV screen with the "Robinsons" DVD on pause. 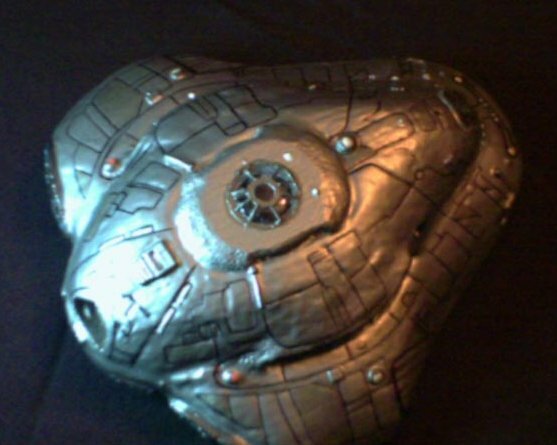 I had a disk shaped piece of plastic that was the perfect curvature for the fusion core at the bottom so that dictated the size of the model, which is only about 6 inches wide. The bottom hull is balsa wood the upper hull is styrofoam that was cut and sanded into shape. Many coats of a gesso-like paint made for styrofoam was applied to protect the foam for spray painting, since most paints can dissolve foam. I hollowed out the front and back to make the cockpit and airlock areas. My camera can't quite capture it but there is a tiny control board and 2 tiny pilot seats inside. Detail lines were carefully tooled in with a sharp nail. Some bumps and other details were glued on. Then the whole thing was primer coated and sprayed metallic. 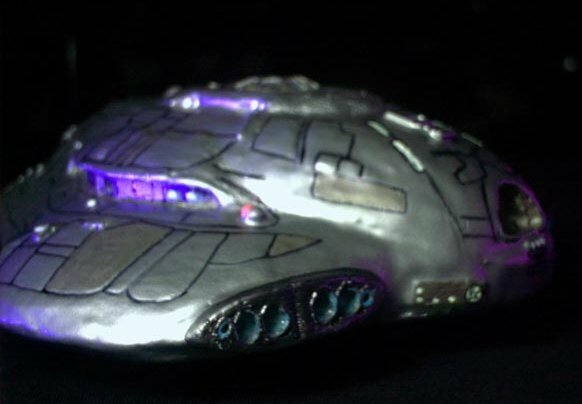 Detail lines were then made more visible with an ultra-fine sharpie pen and "lights" and engines were done with glow-in-the-dark blacklight reactive paint. I'm not a professional modeller, but it is a hobby and I feel that I got it as accurate as what I could make out from the DVD. It's probably not 100% but it's extremely close. 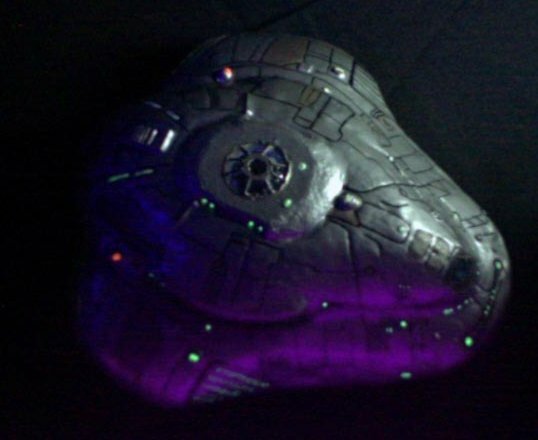 It photographs well and I use a blacklight to get the glow of the lights to add realism. (*) Note: This Jupiter-2 was based off the WB unaired pilot of the "The Robinsons".